US, 1938, 95 minutes, Black and white. Charles Boyer, Hedy Lamarr, Sigrid Gurie, Gene Lockhart, Joseph Calleia, Alan Hale. 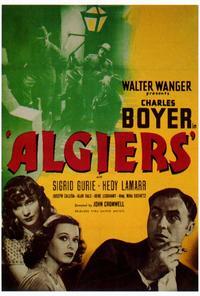 Algiers is based on the French classic by Julien Duvivier, Pepe le Moko. It, in turn, was modelled on the American gangster films. This version by John Cromwell (Prisoner of Zenda, Abe Lincoln in Illinois at this period) actually follows the French film closely. The. set design and the black and white photography and lighting suggest the French style of the period. Charles Boyer is excellent as Pepe le Moko. Hedy Lamarr has only to look beautiful. Boyer was nominated for an Oscar, as was Gene Lockhart for his support role as the traitor. There are interesting supporting performances, especially by Joseph Calleia as the wily Algerian police inspector. The material is most familiar by now, but it had its originality in the '30s. It was remade with music in the '40s by John Berry as Casbah, starring Tony Martin and Yvonne de Carlo. 1. Enjoyable gangster film? Classic of its kind? 2. Technical qualities: black and white photography and lighting, in the French style of the period? The atmosphere of Algeria and Algiers? The visualising of the Casbah? Angles, close ups? The editing and pace? Musical score? 3. The title and the exotic overtones? The introduction with the map, the voice-over comment on Algiers, the close-ups of the Casbah, its seeming ordinariness, its narrow streets ? almost like a prison? 4. The adaptation of Pepe le Moko? The homage to French filmmaking (in turn the homage to the American gangster film)? The significance and style of the cast? Oscar-nominated? 5. The French police, brash attitudes towards the colonies? The bluntness of the inspector, his not understanding the Casbah and the many local customs? The contrast with the wily local inspector? His infiltration into the Casbah, knowing people, knowing Pepe and threatening him with arrest? But biding his time? The contrast with the two styles? The success of the inspector? 6. Charles Boyer as Pepe le Moko, refugee from Paris, his yearnings for Paris? His being trapped in the Casbah? His associates, jewel merchants, his friends, card-playing, the traitors? Inez and his love for her? His lifestyle and protection? Carlos and his wife? The arrival of the tourists,	his encounter with Gaby, seeing her jewels, seeing her? The fascination, her return? His invitations for her to come back, falling in love? The others expecting him to rob her? The inspector aware of this? The invitation to the Casbah, her not arriving, his decision to go out? The letter? The interrogation of the traitor, with Regis betraying Pierrot, having the letter and Regis's subsequent execution, his going to the boat, the money, going to leave with Gaby? The betrayal by Inez after her pleading with him? on the boat, the inspector arresting him? His request to watch the boat leave? Running after the boat, his being shot and escaping by death? 7. Hedy Lamarr as Gaby, beauty and intrigue? With her fiance, the travelling Group? The wealthy life? Going into the Casbah, attracted by Pepe? 8. The people of the Casbah: Mgis and his intrigues, betrayal, smooth talking, fears, being shot? Carlos, support, wanting the jewels, his wife, being captured and tortured? Pierrot and his youth, his death? The bearer of the letters? The jewel merchant? The world of intrigue? 9. The tourist group, the fascination of the Casbah? Gaby and her fiance? Not wanting to go into the Casbah, returning? 10. The atmosphere of intrigue? The emphasis on plot and its development and familiarity? The focus on close ups of characters, the atmosphere of the characters, the mystique of the relationship and the intrigue?